Is pink the new white? A complicated new era for rosé. (Thanks to VMAC & Cheese for bringing this article to my attention. Do you follow her blog? You should.) 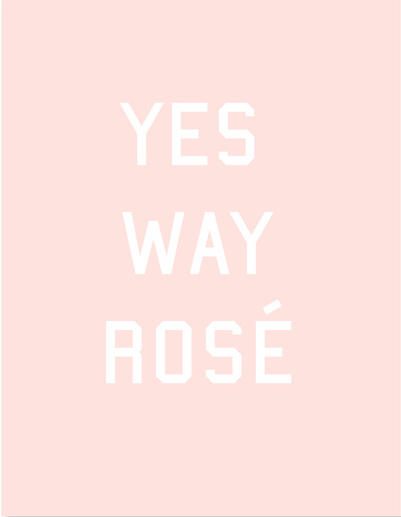 And yes, I will be gushing about rosé all summer, so let's just accept that now. One of my favorite online shops, Waiting on Martha, is having a HUGE sale: 40% off sale items with code MOVEITALLOUT. Including some great finds for entertaining - I especially love these black cabana stripe place cards by Sugar Paper, royal coasters by Rifle Paper Co., and Shelter Island guest soaps by Jonathan Adler. All great additions to your hostess gift stash. Is everyone else LOVING J.Crew for Paperless Post?! I might have to plan a cocktail party just for an excuse to send this cheeky invitation. Ashley Brooke Designs just released her summer collection. These gift tags - especially the one that says "Let's eat cake!" are officially on my wishlist. And now that the "Let's always be fancy" mug is back in stock, I might have to add that also.